On January 20, 1961, the newly-elected President John F. Kennedy, at his inauguration in front of the Capital, told Americans to “ask not what your country can do for you, ask what you can do for your country.” Over 800 miles away, in Jefferson, Wisconsin in an institution called “St. Coletta School for Exceptional Children” lived a 43 year old woman, who perhaps was listening to the address on the radio. 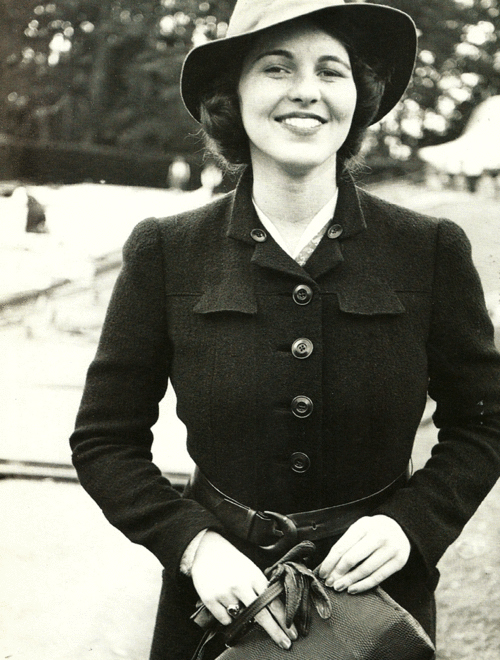 Her name was Rosemary Kennedy and she was President Kennedy’s little sister. Rose Marie (“Rosemary”) Kennedy, born on September 13, 1918, was the third child and first daughter for Joe and Rose Kennedy. No source could quite pinpoint why Rose Marie had issues, but they were apparent very early on. As we now know, there can be several factors/reasons for development disorders – genetic, infection, exposure to environmental toxins, and other complications. Rosemary’s mother claimed several times that the nurses, due to the tardiness of the doctor, tried to halt her labor, injuring the baby in the process. Even early in life, accounts describe Rosemary to be “slower to crawl, slower to walk and speak than her two bright brothers.” She had a hard time “eating with a spoon and steering her sled.” In first grade, she was having difficulty keeping up in school. In fact, Rosemary kept a diary during this time that was only uncovered in 1995. The diary is thought to cover 1936 through 1938, when Rosemary was 18 to 20 years old. She describes trips, riding horses, dances, spending time with family, teas, and even a meeting with King George VI and Queen Elizabeth. In 1938, the whole Kennedy clan took a trip to England and was presented in front of the royal couple. As Joe Kennedy said at the time (recounted in the diary), “Rose, this is a hell of a long way from East Boston.” Rosemary, along with her sisters, performed the rather complicated royal curtsey. By all indications, Rosemary had a fantastic time – though Leamer reports that Rosemary nearly tripped and fell when presented. That same year, Joe consulted with doctors to try and find a way to help his daughter (though some more nefariously speculate that he was simply worried about Rosemary embarrassing the family) and came upon a “promising” new procedure developed by Portuguese physician Antonio Moniz called a “leucotomy” or known today as a lobotomy. It was seen as a last resort for those suffering from extreme psychiatric disorders, giving the patient a “hope for contentment.” The theory was that by severing the nerve connections to and from the prefrontal lobe, it would “fix” certain mental illness, depression, and a host of other developmental disorders. Of course, by doing this, it potentially sacrificed the patient’s personality and some level of their intellect; but, at the time, the potential benefits were often seen to outweigh the potential drawbacks due to the lack of other viable treatments for possibly severe mental disorders. In the 1940s, performing lobotomies wasn’t on the fringes of science either. In fact, Moniz won a Nobel Prize in 1949 “for his discovery of the therapeutic value of leucotomy in certain psychoses”. While the surgery did make her docile, it also resulted in her being unable to speak, walk, or communicate really at all. It also rendered her incontinent and significantly diminished her previous mental capacity. (She was much later in life able to recover some motor skills, such as the ability to walk with the help of a walker). Needless to say, Joe Kennedy was crushed. The procedure that was supposed to help his daughter ultimately left her, for all intents and purposes, completely incapacitated. As for John F. Kennedy’s own relationship to his sister, during the campaign, it was claimed she was “too busy” to make public appearances. It was only after JFK’s election in 1961 that they acknowledged that Rosemary was “mentally retarded.” On October 31, 1963, the President signed the Mental Health Work Bill, attempting to free patients from lives stuck in institutions. While never explicitly stated, this may been inspired by his sister Rosemary. This was the last bill ever signed by JFK. In 1962, Eunice wrote a heartfelt and, at the time, incredibly open article about her sister published in several magazines. She never mentions the failed lobotomy, but says that her family (mostly referring to her mother) did the best they could with Rosemary. She called her sweet, beautiful, and talks about the sadness they had in the family for her, acknowledging that she was “mentally retarded” and “keeping a retarded child at home is difficult.” Eunice Shriver Kennedy would continue to talk about Rosemary the rest of her life and would create the Special Olympics in dedication to her sister. Rosemary Kennedy lived until she was 86 years old and passed away January 7, 2005 in Fort Atkinson, Wisconsin. Does John F. Kennedy’s Statement “Ich Bin Ein Berliner” Really Mean “I am a Jelly-Filled Doughnut”? The words moron, imbecile, and idiot originally meant different things. Originally, in psychology, those who had an IQ between 0 and 25 were considered idiots; IQs between 26 and 50 were considered imbeciles; and those who had an IQ between 51 and 70 were considered morons. These terms were popular in psychology as associated with intelligence on an IQ test until around the 1960s. They were then replaced with the terms “mild retardation”, “moderate retardation”, “severe retardation”, and “profound retardation”. While were walking down offensive historical term lane, before “Down’s Syndrome” was called such, people with this genetic abnormality were sometimes called “Mongolian idiots” and the syndrome itself was called “mongolism”. You might think this must have been an extremely antiquated term, but in fact it was used commonly all the way into the 1970s. The first IQ test was created by French psychologists Alfred Binet and Theodore Simon in 1911. This initial test measure intelligence by having children point to their nose and count pennies. The word “moron” was coined in 1910 by psychologist Henry H. Goddard and was derived from the ancient Greek word “moros”, which meant “dull”. “Idiot” derives from the ancient Greek, “idio”, meaning “person lacking professional skill” or “mentally deficient person incapable of ordinary reasoning”. Retarded comes from the Latin “retardare”, which means “to make slow, delay, keep back, or hinder”. The first record of its use for someone considered mentally deficient was in 1895. In the early 1970s, my wife and I visited her sister and her in-law relatives on Long Island NY. Their family was historically in the business of maintaining homes while the owners were absent. While driving around looking at all of the beautiful homes in South Hampton, we came across one home that looked like a set from one of the “haunted house” movies. It was visibly broken and overgrown with weeds; completely out of character in that neighborhood. These folks we were with (and they should know) described it as the home of JFK’s aunt, but that’s all they knew about it. When I first read the title of your current article, I thought maybe Rosemary was the “aunt” that they spoke of, but it doesn’t seem like she ever made it out of Wisconsin. Do you know any more about the Long Island house? This sounds like Grey Gardens, the home of Jackie Kennedy’s aunt and cousin from the Bouvier side of the family. Google for more information. The relatives lived in filth and were really weird. Sorry, my memory fails me some. I certainly meant to say East Hampton NY. One post script you missed is the fact that in addition to Eunice starting “Special Olympics” in dedication of Rosemary, Jean Kennedy Smith, another sister, started “Very Special Arts” an organization dedicated to bringing the arts and their rewards to people facing physical and mental challenges. It was never as big as Special Olympics and the organization merged in 2011 with the Kennedy Center, nonetheless, it is another reminder of the impact Rosemary’s tragic life had on her family. I met Rose Kennedy once. I did a training session at a hospital in Ossening-on-Hudson NY and she was in a private ward there. Incidentally, so was the sister of Tennessee Williams. When she died, the Williams estate went to this hospital. Odd occurrence – never know what life has in store. Meaning” family members going to realize HONESTY is the BEST POLICY especially when dealing with the millions of ROSEMARY KENNEDY ‘S of THIS WORLD? Interesting article. However, I noticed two errors. Rosemary was not JFK’s big sister, she was a year younger. Also, the reigning monarch at the time the Kennedy girls were introduced at court was George VI, not George IV. @Nancy: Thanks for catching that. Fixed! Nancy am I reading the same article you are? It states in the article she was JFK’s younger sister being born a year later and it does say King George VI and Queen Eizabeth which is correct? I see it was corrected. Sorry didn’t check dates. What bugs me most is that the family did not even visit her all that much (from what I recall less than 5 times the whole time she was institutionalized). What a majorly cruel and inhumane family the Kennedy’s have. Who lobotomizes ones own daughter without telling or asking the mom if she is okay with it? The other kids to Joseph, I can see how they could not visit her when they were kids but they owed it to their sister to visit her when they had their own wealth. Hearing about this really made me see what a load of crap the family was to one another. All caring for themselves and their “precious” image.